Q1.Can people with no experience participate at the session ? 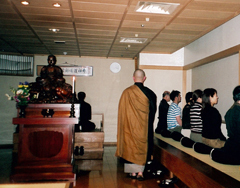 Before the Saturday Zazen, there is a training for beginners. If you are interested in Zazen and can speak Japanese, just come to Kouunji(without prior notice). If you don’t speak Japanese, please send us an email in advance. A2.No special attire is required. 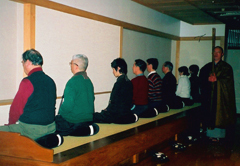 There is no specific dress code to do Zazen, but it is recommended to ware casual and loose pants to feel relaxed. Tank top is not recommended. Q3.Are there rules in Zazen ? １　No accessories and watches. ３　No socks, no stockings. Q4.Is there a dressing room ? A4.There are dressing rooms to change clothing at Kouunji. There are no accommodations at Kouunji. Q6.Is there a parking lot? Please let us know one day in advance if you wish to use it.